The former site of the Chisholm Television factory is set to become Port Moody’s newest community. 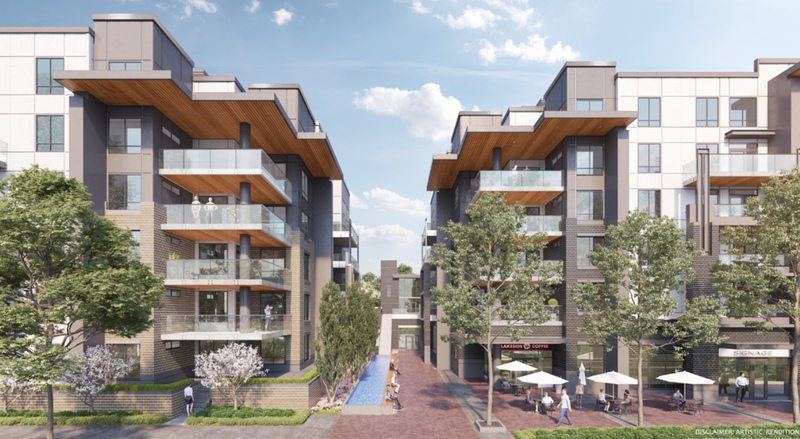 Situated across from Rocky Point Park, on the south side of Murray Street, between Electronic Avenue and Klahanie Drive, 50 Electronic Avenue is a collection of 358 condominium residences in two 6-storey buildings, featuring spacious 1-, 2-, 3- and 4-bedroom floor plans. A large landscaped green space on the south side offers a variety of resident amenities, in addition to numerous leisure and recreation options literally steps away. And for activities beyond, nearby Moody Centre Station conveniently connects you to downtown Vancouver on the West Coast Express or other destinations in Metro Vancouver via the Skytrain Evergreen Line. 50 Electronic Avenue is at the centre of it all. This project is in its development application stage. I recommend interested purchasers sign up to our VIP list above to receive 50 Electronic Avenue updates. Contact me today to discuss availability and plans according to your needs. Residents will enjoy the shared use of 9,000 sq ft of indoor amenities. On the southern elevation, outdoor amenities include five residential courtyards and an extensive landscaped green space, featuring a children’s play area, open lawns, pathways, an off-leash dog area, and an urban garden. the site within a podium. Panatch Properties builds with vision, drawing upon decades of experience and design intelligence to craft homes and workplaces that fit the dynamic needs of the community. Noticeable quality and innovative design are the hallmarks of every Panatch development. Superior construction ensures a solid investment and lasting value you can count on. Panatch Properties builds in and enhances vibrant neighbourhoods that offer an abundance of lifestyle amenities and a true sense of community. At the heart of Ciccozzi Architecture’s identity is a carefully-honed design process – one that promotes co-operation, interactivity, and highly-personalized service for every client. By working closely with clients, Ciccozzi aims to integrate creative solutions through each step of the process, providing a balance of design excellence and economy. The results speak for themselves: quality projects that offer an elegant and innovative architectural expression, and lasting value for clients and communities. The practice of architecture is where art and technology intersect. Ciccozzi strongly believes that the best design comes not from a predetermined aesthetic, but rather reveals itself through a process of discovery. Are you interested in learning more about other homes in Coquitlam, Port Coquitlam, or Port Moody? Check out these great Tri-Cities Presales!